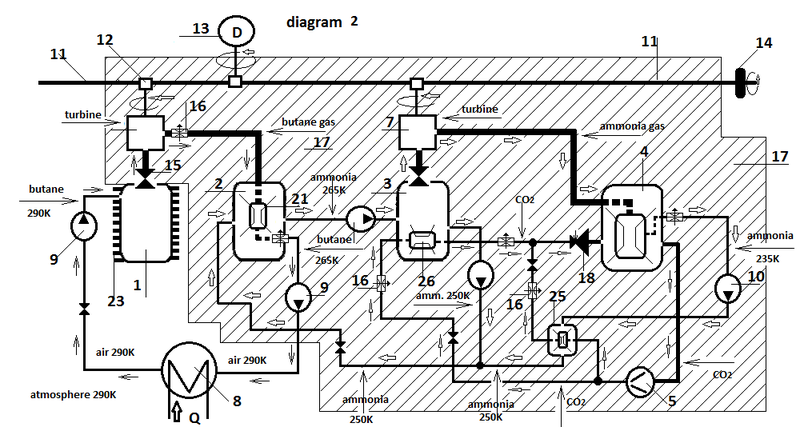 External combustion engine with closed cycle of working substance. 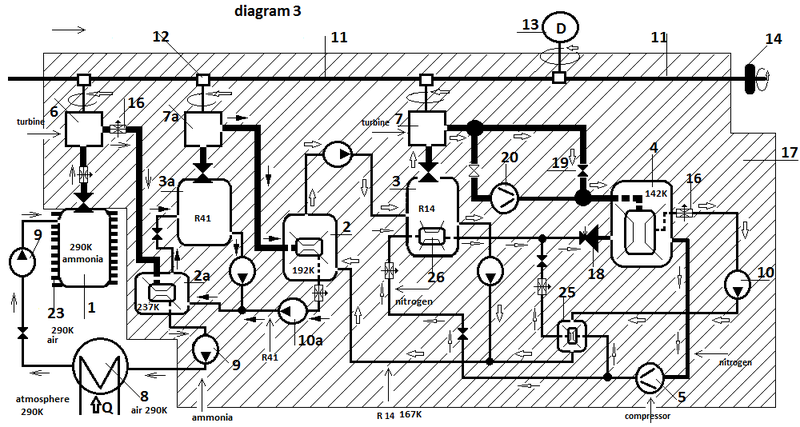 The cycle closes as a result of applied work on the working substance, unlike the current engines, cycle on which closes as a result of heat exchange. Recently I added another method for external combustion engine and internal cooling - using more than one working substance. I think that gets efficient engine - the work that needs to use to close the cycle is less than the resulting production work. 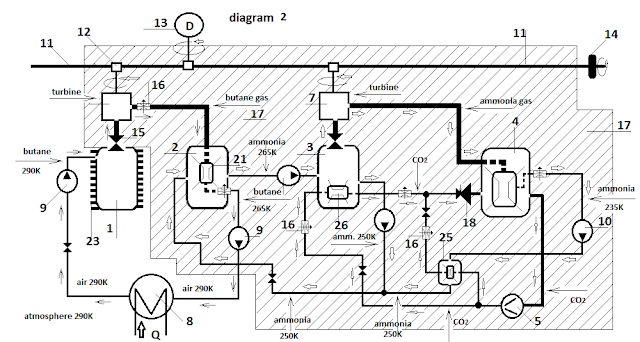 Look at the following chart, which represents the external combustion engine with two working substances – diagram 1. Both work in a closed cycle, and two-cycle heat exchange with each other. As a result of the heat exchange cycle of the first (water) is closed. The second (diethyl ether) I will add force to close its cycle - compressor 5 will cool the gas to its liquefaction . The first (water) heat exchange with the heat source. Second (diethyl ether) is working in heat isolated environment -17 is thermal insulation. 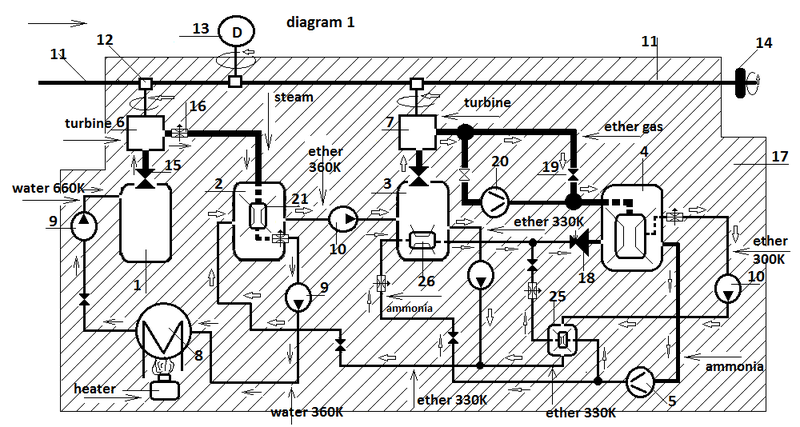 Gases ether after turbine 7 entering the "fridge" 4. There due to the operation of the compressor 5 and an expansion valve 18 the ammonia which is charged "refrigerator" was evaporated, and to dissipate the heat of the gases ether to liquefy them. For such an engine there are two useful power - turbines 6 and 7 and one an opposite - of the compressor 5. If we ignore the energy needed to run the pumps 9 and 10 my opinion is that this engine will work - two useful forces against one opposing force to them. Should remain our mechanical force in "profit". If you agree with those of my assumptions - I suggest you go down to the lower temperatures and other working substances as in diagram 2. Things on chart 2 are the same as chart 1 - two useful energy from the turbines to the opposite one of them - the compressor on "the refrigerator". R 41 - 195K B.P. R 14 - 145K B.P. On refrigerant - Nitrogen - 77K B.P. 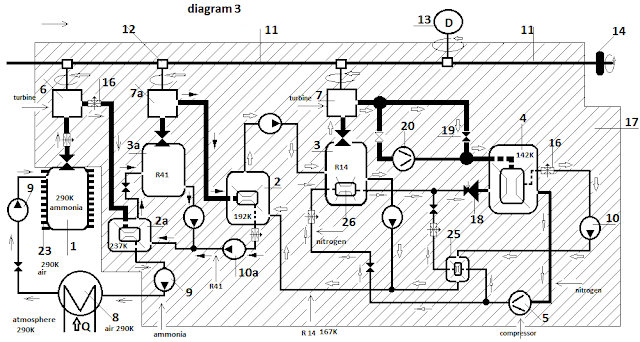 Two cycles (ammonia; R 41) closed free - as a result of heat exchange (as is the traditional external combustion engine). A cycle on R14 closed as a result of work done on the working substance ( by compressor 5). The ratio of beneficial to the opposing forces is 3 to 1? - three turbines to the compressor. 123/25 - the approximate ratio of useful energy to opposing force - 5 to 1? Most true than I think it should be given the quantities of heat – Ideally each working substance in its working cycle may become 50% of the amount of heat into mechanical force. So after the first remaining 1/2, after second 1/4 and remains after the third 1/8 of the original amount of heat. So the power we need to apply to the compressor on "cooler" to the useful will relate 8 to 1? in favor of the beneficial forces, (ignoring the operation of the pumps). To draw attention - working substances in the insulated part of a temperature below the boiling point - pre-cool them to run the unit. Публикувано от Svetozar the Cold в 23:30 ч.